People normally find crabs on the beach, in a crab pot, or perhaps on their dinner plate or in the local seafood shop. Just recently crabs have made an appearance in unexpected places – like the linen closet. Not edible perhaps, but cuter than the real thing. Just follow these directions and you too can go crabbing in your towel cupboard. 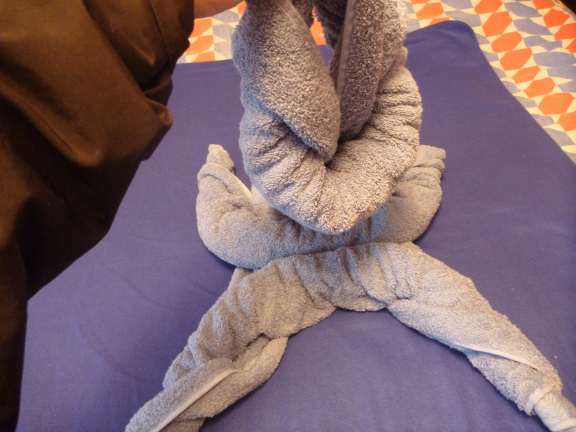 While making a towel frog, at the point where the head gets inserted into the body, but before it gets positioned as a frog, it reminded me of a crab. So I decided to make a crab. The next day I decided to try making a mini-crab too, and have included instructions for it as well. 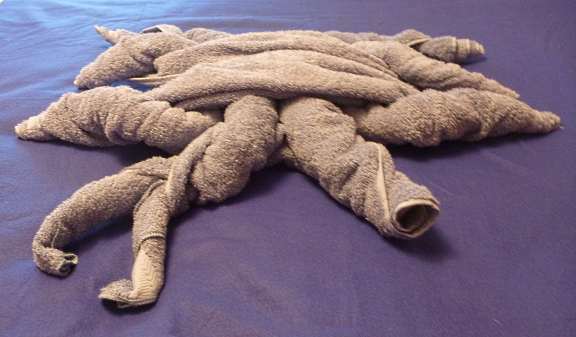 Supplies needed for big crab: 2 bath towels, 2 wash cloths, 1 hand towel, 2 pipe cleaners, 2 googly eyes. For small crab: 2 hand towels, 1 wash cloth, 2 pipe cleaners, 2 pom poms, 2 googly eyes. Start with the basic animal body, except instead of the usual one body, make two. 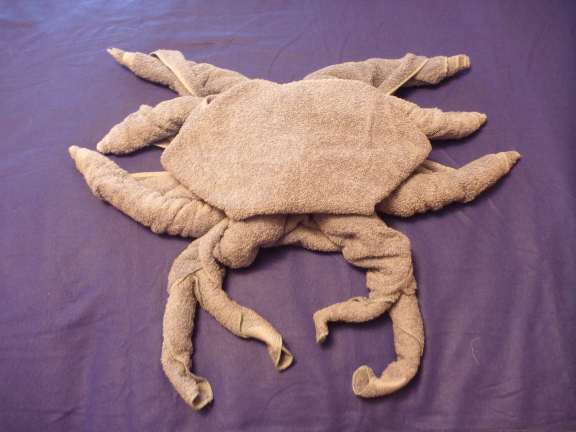 Use two bath towels for the big crab, or two hand towels for the small crab. 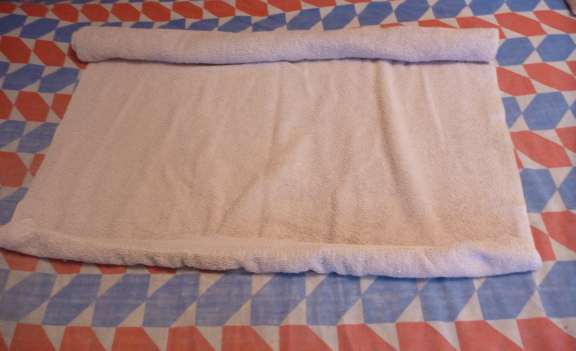 For each body, lay the towel out flat and then roll each end in to the middle. Start by folding over just a small bit on the edge at the beginning of the roll. Each roll should be not too tight, yet not too loose either. 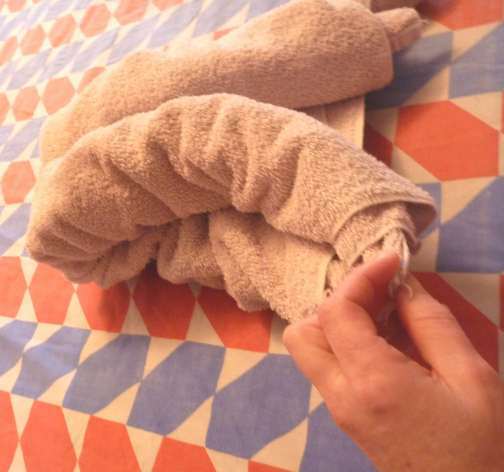 Fold the rolled towel in half, with the rolls on the outside. Pull the tips out of the end of each roll. Take the tips of both ends of on roll in one hand, and both ends of the other roll in the other hand. Pull tight. Repeat for second body. 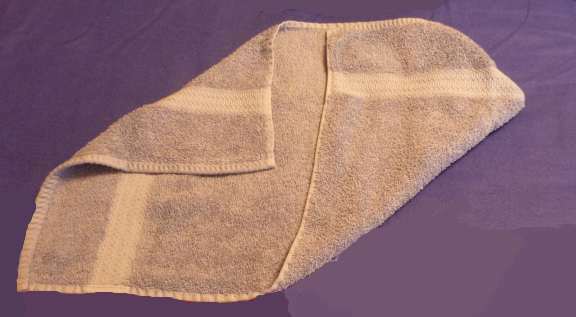 For video and more detailed instructions on the basic animal body, see the towel rabbit folding blog. Set one body down with the rolls on top. Flip the second body over and insert the open space between the rolls on the top body over the rolls on the bottom body so the two bodies cross like the letter t.
On the large crab, pick two of the legs that are together for the pincers and position them to the front of the crab, with the rest of the legs positioned out to the sides. Push the tips that were previously pulled out of the ends of the legs back inside on the two chosen as pincers so you have an open tube. 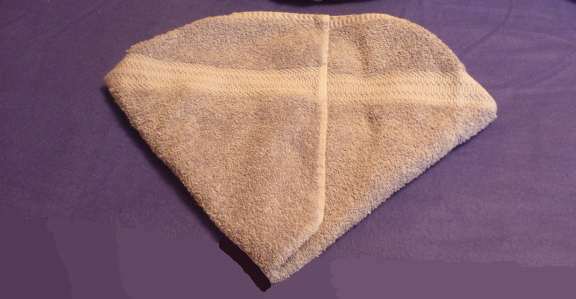 Roll one washcloth diagonally. 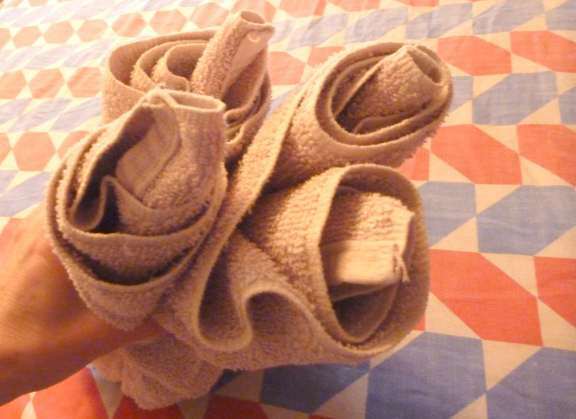 Fold it in half and insert into one of the prepared towel tubes. Repeat with other washcloth. Shape into pincers. Use a hand towel for the shell on the large crab, and a washcloth for the shell on the small one. 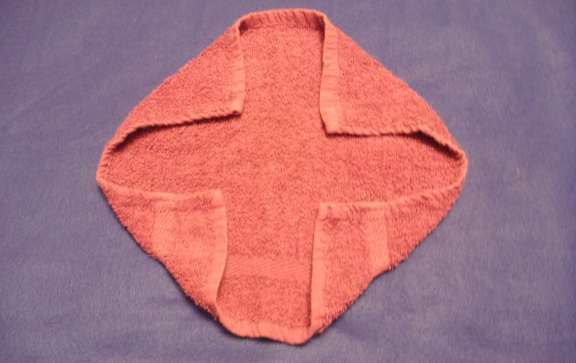 Start the shell for the large crab by folding over two corners of the hand towel along one long side. Fold the opposite corners so they cover the previously folded corners. Fold down the tip at the pointy end, then flip shell over and set it on crab with the folded down pointy end at the front of the crab. Wrap one end of pipe cleaner around googly eye. Make a 90 degree bend in pipe cleaner at the point you want the eye stalk to end. Tuck folded end of pipe cleaner under shell to hold eye stalk in place. Repeat for other eye. 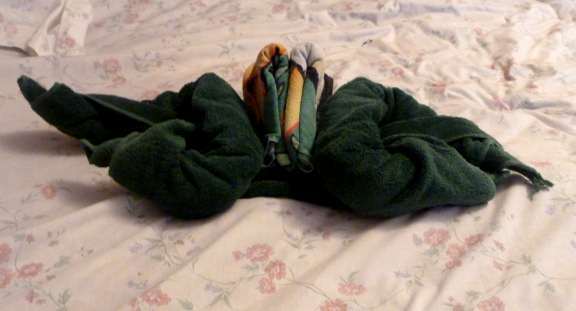 For more interesting crabs, try using different colored towels for shell and pincers. 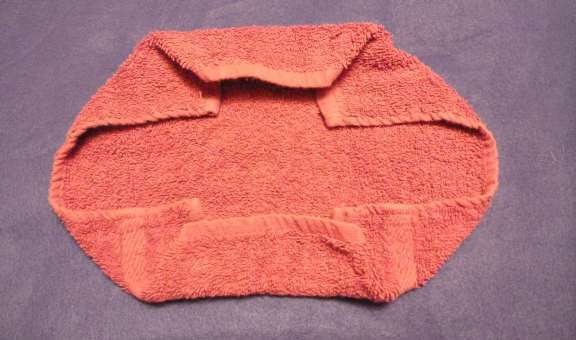 To make the small crab shell, start by folding down all four corners of a washcloth. Fold down two edges to shape the shell. Flip it over and place on top of small crab. Twist two pipe cleaners together and shape ends into pincers. Tuck under shell and position as desired on front of small crab. Use pom-poms for the eye stalks, topped with googly eyes. Hold in place with a touch of scotch tape. Other towel folding instructions: gorilla, seal, cake, monkey, snake and more. 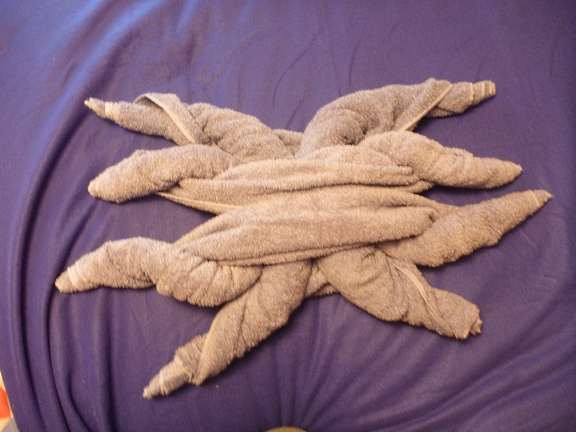 This entry was posted in Randoms, Towel Animals and tagged crafts, fun, pictures, project, random, towel animals, towel art, towel folding. Bookmark the permalink. Crustaceans have five pairs of legs. Arachnids have four pairs though, maybe you could make a spider. Well the one that initially reminded me of a crab only had 2 pairs of legs, so close enough.